The B-2A 'Spirit' was an aircraft conceived to fight the Cold War but which has proved invaluable to both the 'New World Order' and more recently the 'War on Terrorism'. The combination of low-observability, precision strike, range and payload flexibility has made the 'Spirit' the weapon of choice when America hits its enemies at the start of a campaign. Spirits have fired the first shots of Opera… tion 'Allied Force' over Kosovo and Serbia, as well as operations 'Enduring Freedom' and 'Iraqi Freedom'. 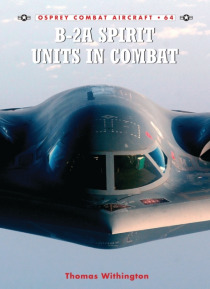 Despite the tremendous cost of the aircraft each unit is literally worth its weight in gold the B-2 has had an impact on modern warfare which has vastly exceeded this small force of 21 bombers. Developed in utmost secrecy, the B-2's gestation saw the use of new computer design and manufacturing techniques and ultra-modern synthetic materials making it the most revolutionary aircraft in terms of design and performance. This book examines these incredible aircraft.